Modernising Public Procurement. The Approach of EU Member States, a new book with contributions by many EPLG members, is on pre-order now! The book was edited by EPLG Members Steen Treumer and Mario Comba and it was published by Edward Elgar Publishing, in their European Procurement Law series edited by Steen Treumer and Roberto Caranta. It welcomes contributions by R. Ågren, P. Bogdanowicz, M. Burgi, R. Caranta, M. Comba, D. Dragos, P. Ferk, K. Härginen, F. Lichère, B. Neamtu, S. Richetto, A. Sanchez-Graells, M.A. Simovart, A. Sundstrand, S. Treumer, P. Valcárcel Fernández, D. Wolff. 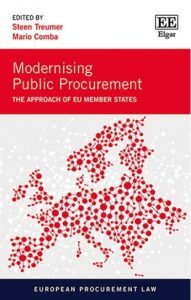 The book can be pre-ordered at https://www.e-elgar.com/shop/modernising-public-procurement, with an online 20% discount. This topical book offers an in-depth analysis of the recent implementation of the Public Procurement Directive, based on the experiences of 12 Member States including France, Germany, Italy, Poland, Spain and the United Kingdom. The contributions from first-class public procurement law experts offer an informed and comparative analysis of the recent implementation of the Public Procurement Directive, as well as focusing on so-called gold-plating (overimplementation) and issues where the legality of the implemented legislation is questionable. Vitally, the chapters also consider national preparatory works as a legal source and their interesting role in the implementation of the Directive including its Preamble. Attention is also given to the implementation of some of the most important novelties in the Directive such as the exclusion grounds, the competitive procedure with negotiation and contract changes. Modernising Public Procurement will be important reading for practitioners and civil servants involved in the implementation of public procurement law. Academics, researchers, politicians, judges and members of complaints boards in the field of public procurement law will also find this book a stimulating read.